MainOpEdsWill Trump be confronted by a 'State of Palestine' at the UN? “The State of Palestine” does not meet the criteria for statehood required under the 1933 Montevideo Convention, so what is this farce? UNGA Resolution A/RES/73/5 - adopted on 16 October 2018 – put this illusory “State of Palestine” centre stage for PUN’s 2019 New York season – recognising it as the Bloc’s public face in all matters brought before UNGA and at meetings of representatives of other major groups. 146 countries voted for this Resolution whilst only three - Israel, the U.S. and Australia - voted against, 15 countries abstained and the remaining 29 states did not vote. "We cannot support efforts by the Palestinians to enhance their status outside of direct negotiations. The United States does not recognize that there is a Palestinian state. … Only U.N. member states should be entitled to speak and act on behalf of major groups of states at the United Nations."" The Handover Ceremony took place in the presence of UNGA President Ms. Maria Fernanda Espinosa Garcés, UN Secretary General Mr. António Gutteres, Mahmoud Abbas – the self-styled “President of the State of Palestine” (formerly called “the Palestinian Authority” before Abbas unilaterally changed its name in 2013) and Bloc members. Regrettably the Secretary General failed to elaborate on where he believed “Palestine” is located, who he considers are its citizens, its capital, the area it controls and its current government. The Handover Ceremony included a 1 hour concert featuring live performances of Astor Piazolla’s “Oblivion”, a Brahms sonata for violin and piano, five works by three Egyptian composers extending over 26 minutes and just 4 minutes of “Palestinian folk songs” whose provenance was not mentioned in the program notes. One Egyptian composition - “Lessa Faker” – aptly describes the path UNGA needs to take to end this blatant “State of Palestine” fakery that flagrantly violates international law. 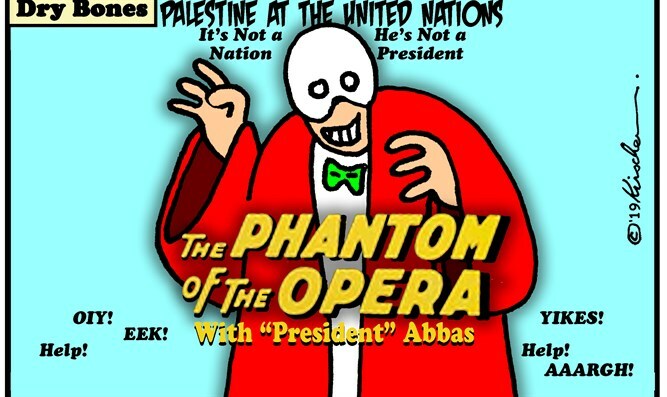 President Trump’s response could well see him consigning the “State of Palestine” to diplomatic oblivion to the accompanying strains of Piazolla’s Oblivion – with the United Nations left lamenting at the wake that it holds for the phantom State. This is truly Theatre of the Absurd - Multilateralism gone mad.